The small climbing area Pyli is obviously not as famous as other Greek climbing areas such as Kalymnos or Leonidio. However, this little gem is absolutely worth a visit. It might be not the best place for a cycling and climbing trip as the approach is rather long and not doable by bike. But bring enough food for a week and you can stay in this quiet place for a week or so. We left our bikes at the bottom and carried all our stuff up, which took us about 2 hours. More about our time in Pyli is presented in our blog. The climbing wall is just next to a large wooden platform, which makes Pyli very comfortable. Rock and routes: The routes are mostly slightly overhanging routes with interesting tufa features or other 3D climbing. The rock quality is excellent, but some parts of the wall can be rather dirty due to lots of nesting birds. Several routes have extensions, which make the routes very long, but good rest positions are usually available. 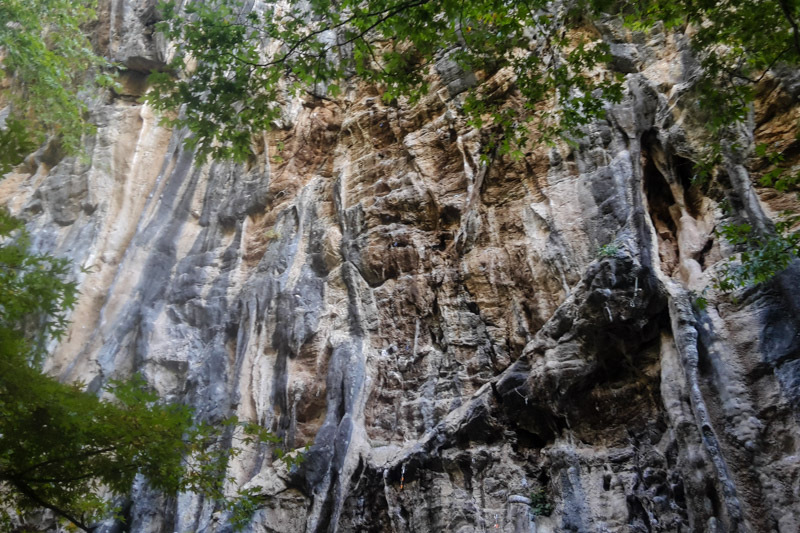 Climbing area and environment: The little gorge close to Pyli is simply magic! High up in the gorge, the climbing area is very isolated and quiet. However, the only exception are lots of birds (crows ? ), which come early in the morning and make a lot of noise. Except of a few other climbers, we saw nobody for a week. Guide book and information: Pyli is included in the new guidebook (2017) from Aris Theodoropoulos called ‘Greece Sport Climbing: The Best Of’. The guidebook includes clear photo topos and all information to access the climbing area. Most route names are written at the bottom of the wall and a list with all grades is hanging at the wall. The climbing routes in Pyli are rather hard and start at the 7th French grade. A few routes in the 6th French grade are available, but not all of them are recommendable. Pyli is a good summer crag as it is situated in a shady and cool canyon. The wall is in the shade most of the time, except for a few hours during the midday. Beautiful coloured limestone in Pyli offers a wide range of different climbing routes. 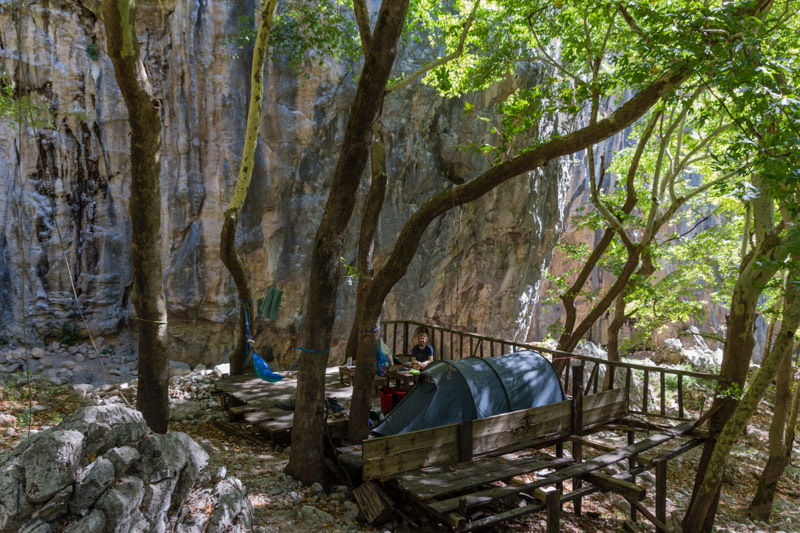 Accommodation: It is possible to camp for free directly next to the wall on a large wooden platform, which is build by local climbers. The platform also serves as a comfortable living room and kitchen. Bring a hammock for the extra portion of comfort. 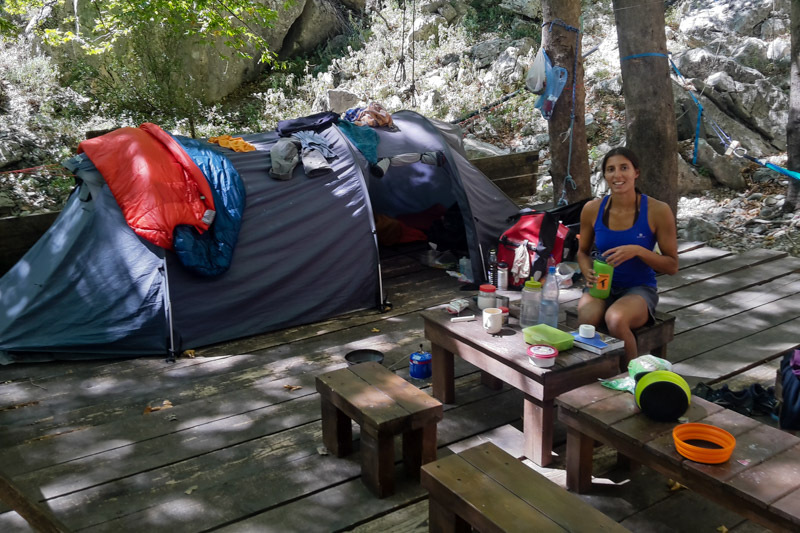 Access to food: There is no food or anything else available in the gorge, except of water. So bring plenty of food, so you can stay for a while and don’t have to hike up every day. We brought food for almost a full week and enjoyed this quiet place to ourself. The town Pyli has a few small super markets which offer basic food. Access to water: There is a large pipe running down the gorge, which supports a village with fresh water. Luckily, a tap is mounted on this pipe, which provides crystal clear fresh water to the climbers. Access by bike: As the gorge is so isolated, the access is very bad. It is possible to cycle to a small parking lot at the bottom of the gorge. A 30-40 min long hiking path starts from there, which is not accessible by bike. We had to hike this path 3 to 4 times to carry all our gear and food up to the climbing area. This was hard work, but totally worth it. In Pyli, a large wooden platform serves as a perfect rest area and campsite.